Once limited to holidays and mint jelly, American Lamb is finding some innovative spots on today’s catering menus. Lamb is the protein of choice throughout many parts of the world so not surprisingly, it fits in with many classic as well as authentic global cuisines. Lamb adds an unexpected and memorable twist to many dishes – from Greek Nachos to Basque Piperade to Kofta Meatballs. When you use American Lamb on your catering menus, you’re supporting the nation’s shepherds and their families. The vast majority of the nation’s sheep operations are family owned and operated. And, they’re located in every state. – from small flocks grazing on the grasses of the Northeast to larger flocks in the high mountain ranges of the West. Today’s shepherds are family-focused, entrepreneurial and dedicated to he health and welfare of their sheep. Best of all, they are committed to producing the best quality lamb. When it comes to ordering lamb, Chef Sam Woodfill of Colorado-based Catering by Design buys local. “Colorado is where you get some of the best lamb in the world,” he said during his presentation at the Art of Catering Food conference in 2018. While rack of lamb is always an elegant catering menu item, Chef Woodfill also likes to experiment with economical cuts of lamb such as ground lamb, braised lamb shanks, shoulder and neck and even lamb bacon. Ground American Lamb can be used in place of other ground meats in most recipes. Chef Woodfill uses ground lamb in his Greek Lamb Meatballs. 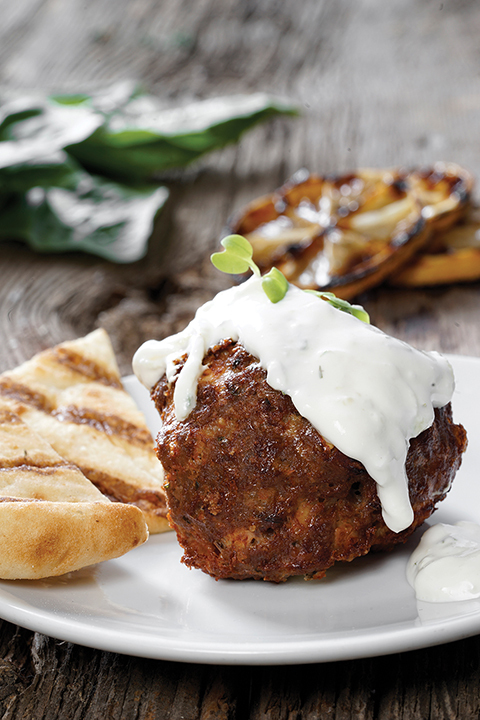 “The best part of the meatball is the big garlicky flavors and how well it is paired with the tzatziki sauce,” said Woodfill. Shanks, shoulder and lamb neck are economical cuts of lamb that can be used in many braised dishes. 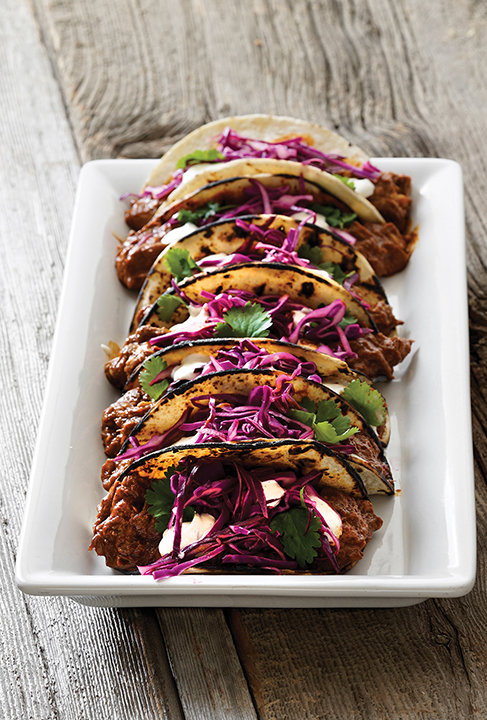 Lamb Shanks are marinated in a spicy marinade which includes Guajillo and Ancho peppers to create Chef Woodfill’s Lamb Shank Barbacoa Street Tacos. Chef Woodfill then slow roasts the shanks wrapped in banana and avocado leaves until they are tender and the lamb meat falls off the bone. Lamb Bacon may be used in place of other bacons in most dishes to give the dish a premium twist. 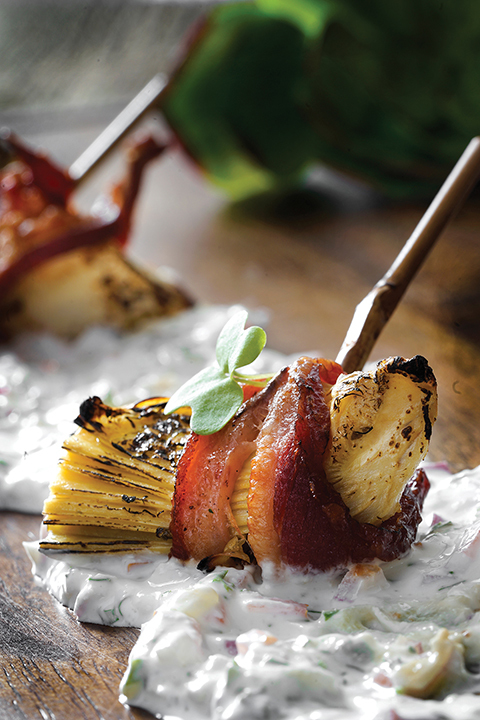 Lamb Bacon-wrapped Artichoke Hearts work well on passed appetizer menus. For these lamb catering recipes and more, visit americanlamb.com. Your customers care about where their food comes from so call out fresh, homegrown lamb on your menus. Feed their adventurous side.